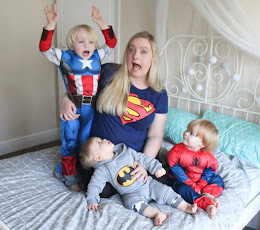 Today I thought I'd share a little tour of Tyne's Big Boy Bedroom! 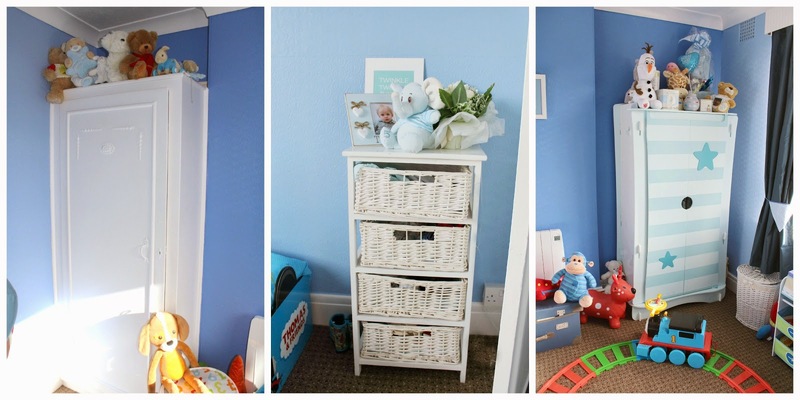 Last time we did a room tour was only back in October, but we have since moved house and when we did - we decided to make a few changes to Tyne's bedroom! In our new house, Tyne has a much bigger bedroom and the walls when we moved in were painted cream - as all of his furniture is blue, this didn't match too well so we decided to spruce it up a bit. While we were away at Bluestone a few weeks ago, my lovely Mum & Dad very kindly took on the task of painting the room for us as obviously it's difficult to do while Tyne is sleeping in it due to the lingering paint smells! 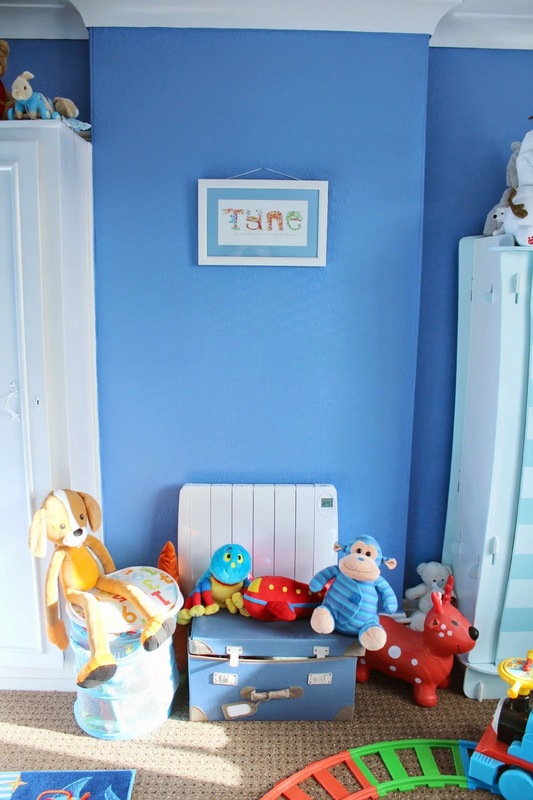 Tyne's old bedroom was a much lighter shade of baby blue with cloud details, which I do miss a bit - but as his room now has his toddler bed instead of the white cot he used to sleep in, it made sense to go for darker shades of blue to bring everything together. We have the three of the walls painted in a slightly lighter shade of blue, and the far wall in a darker shade - I like the contrast of colours and feel it makes things a bit more interesting! 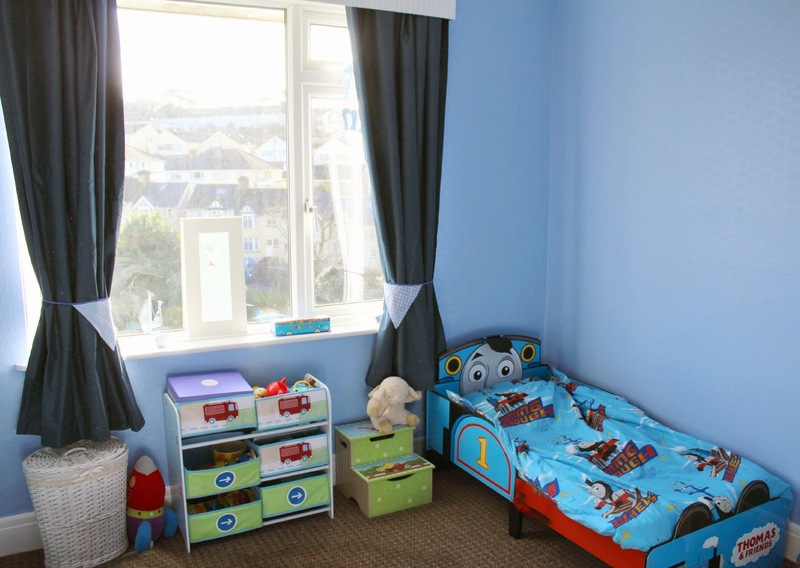 We are pretty lucky that in this room, the bedrooms have large built in wardrobes - but as we LOVE Tyne's own wardrobe so much we didn't want to be without it - instead we use his blue wardrobe for storing his clothes, and the built in wardrobe to store extra toys and bits & pieces which is very handy as he has hundreds! We also have a 3 drawer wicker unit which I use to store his socks, vests and pyjamas - and which still holds his Baby Blooms bouquet and baby elephant from when he was born! 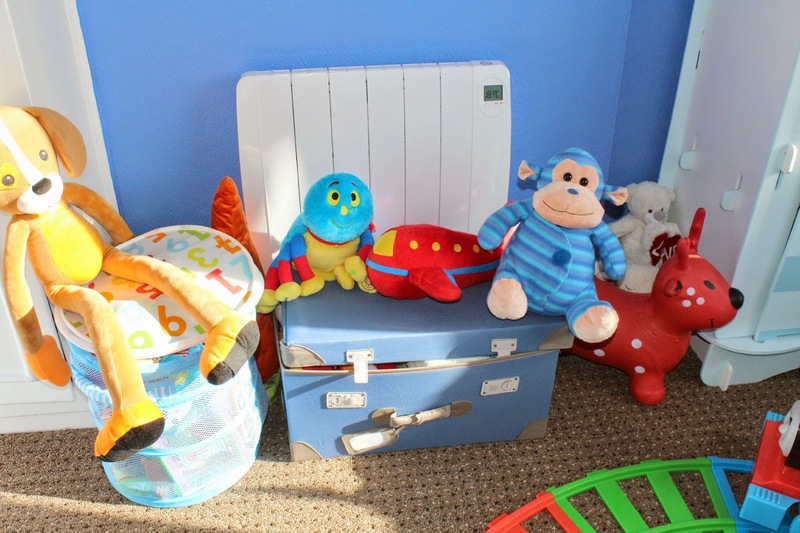 Tyne has a LOT of toys and loads of cuddlies, so storing them can be an issue - I do like to have some out on display as I think all childrens rooms need cuddly toys out! - we have lots on top of his wardrobes but for extra ones we have his little suitcase-style storage chest from Ikea. 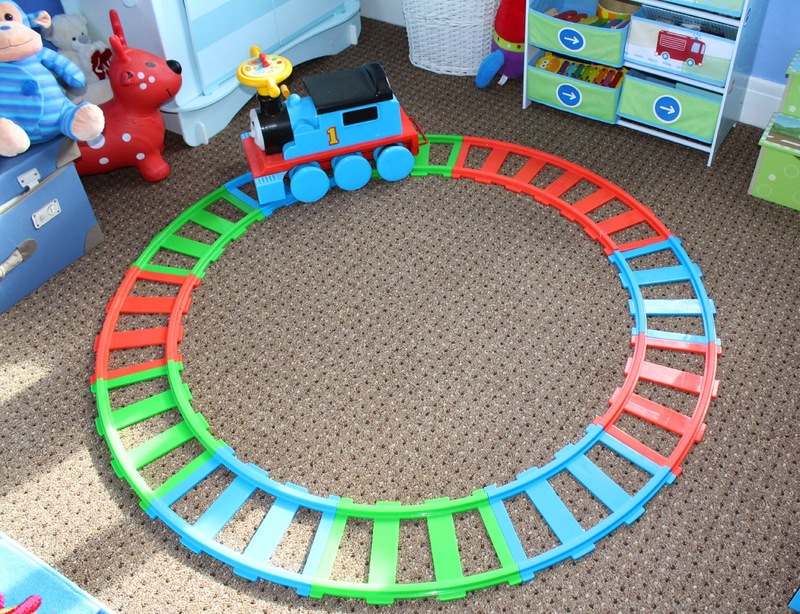 He also has to have his Ride On Thomas and Track out as this is his absolute favourite toy! 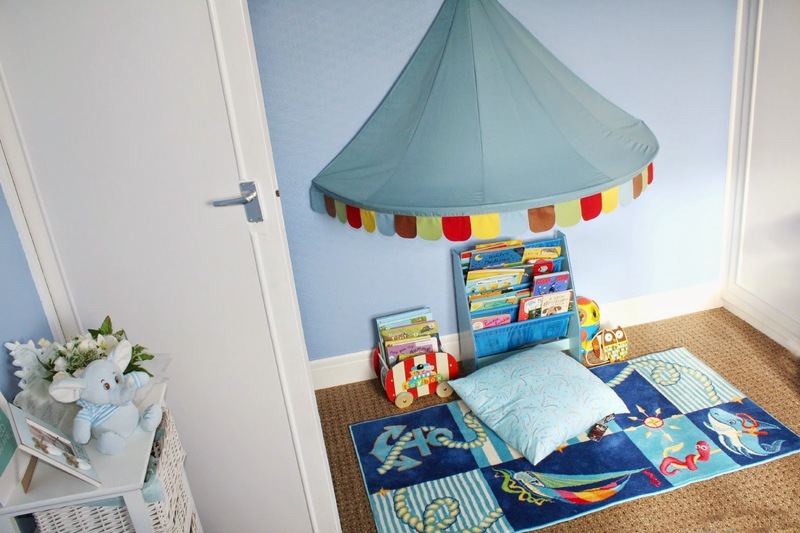 And his book corner had to stay too - he LOVES to read and has a ridiculous amount of books collected already - he loves to sit under his little canopy, snuggle on his cushion and just flick through his favourite stories. 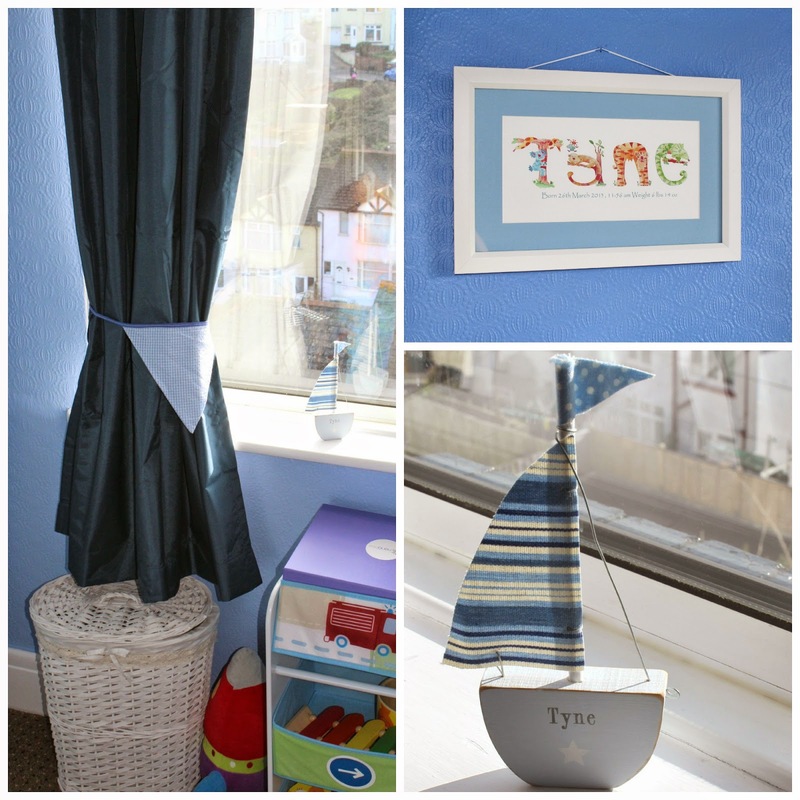 I do love a bit of personalisation, and this is shown in the decor across the bedroom - two of my favourite things are his framed name print and the personalised sailboat sitting on his window ledge. 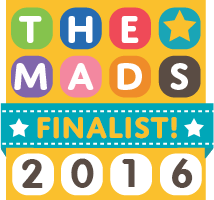 His curtains have been changed from the previous baby blue ones, to dark blue blackout curtains with some bunting as tie-backs. My own personal favourite thing about Tyne's bedroom is the view from his bedroom window! 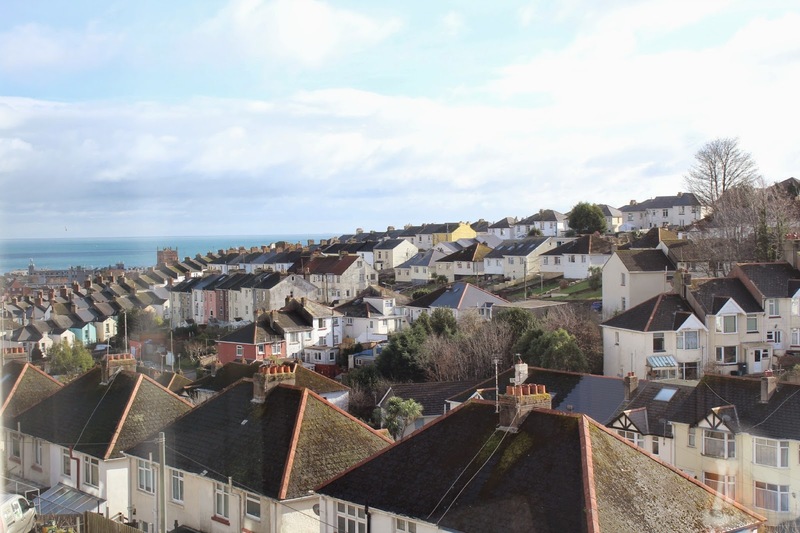 His old bedroom looked out on a row of back yards...his new one has a beautiful view of the sea and the pier! I am pretty jealous of this as our own bedroom is facing the opposite way, and I have to admit - I was so tempted to keep this room for myself! I just hope he appreciates the view as he gets older! One of the biggest changes to Tyne's bedroom when we moved was that we transitioned him from his cot into his Toddler bed! We thought it made sense to do it all at once - new house, new bedroom and new bed! 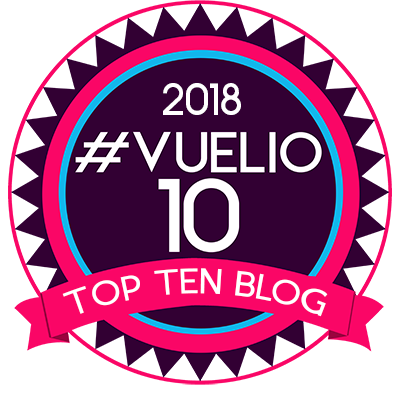 We were of course a bit concerned about how Tyne would react to it - particularly as he had always slept in a baby sleeping bag and the concept of duvets was new to him - but he took it all completely in his stride! 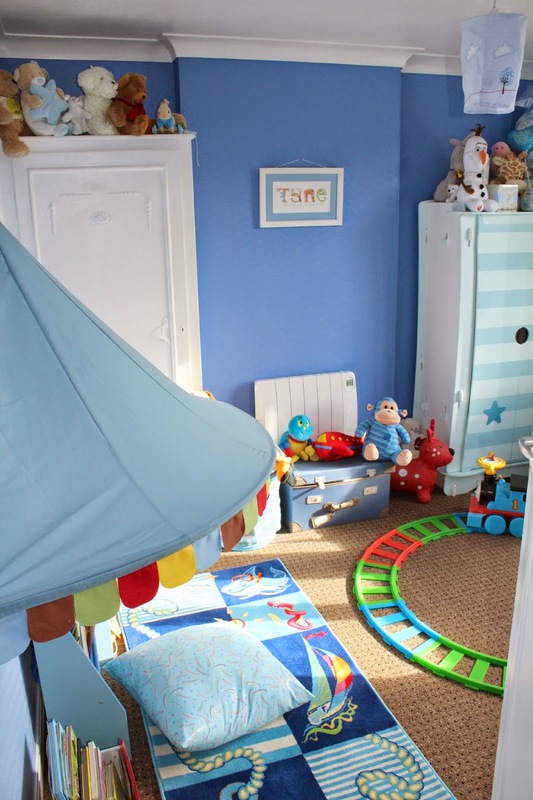 He was sent this absolutely amazing Thomas Toddler Bed from Worlds Apart and he absolutely fell in love with it from the moment he saw it! 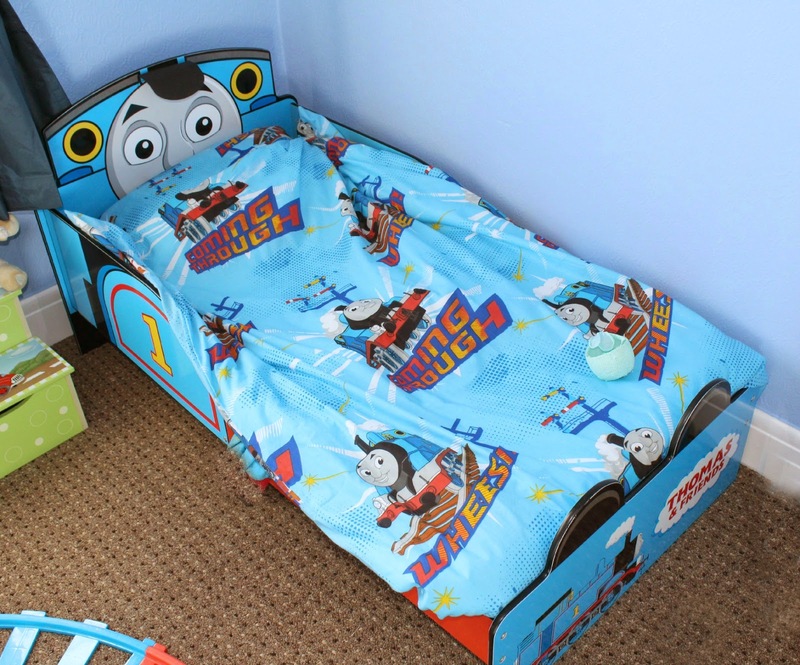 It has been a god send as it really encourages him to go to bed each night - whenever we take him upstairs he always asks for "Thomas Bed"...he even asked for it when we were on holiday a few weeks ago! He adores it, it is just the right height for him so we have no worries about tumbling out in the night as there is hardly distance to fall - this has never happened though and I think the raised side helps a lot. I personally have never been a fan of character-based anything when it comes to childrens bedrooms or clothes, but Tyne just loves Thomas so much that I can't refuse him the joys of having these things...even though they might not be my own first choice!! I prefer to see him happy and with a bedroom he absolutely loves! Another thing that I feel has helped the transition into his new bed is the silk cot bed duvet we've been using, which was from Silk Bedding Direct. 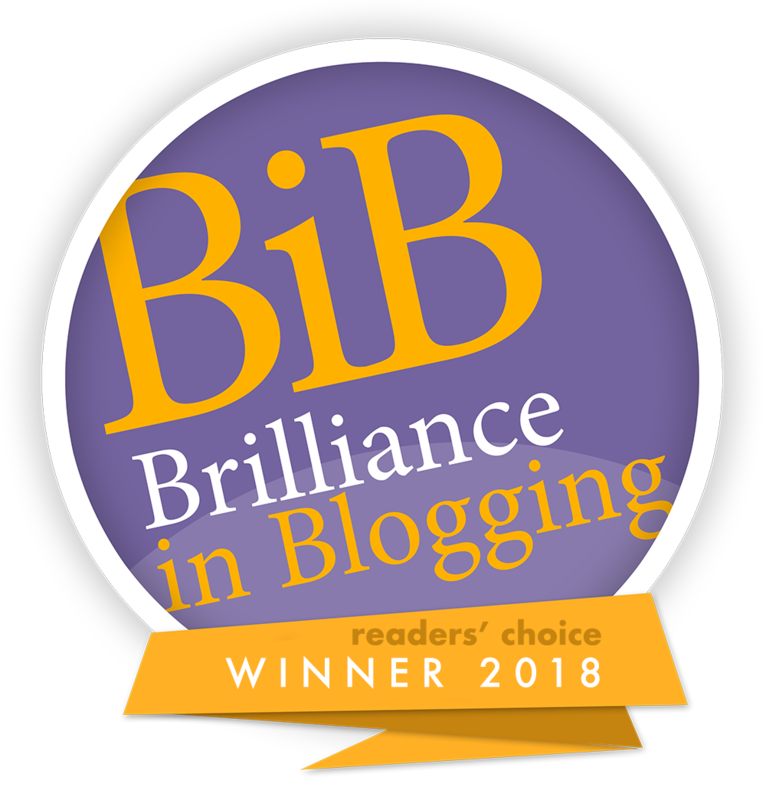 The duvet is made from top quality mulberry silk and is just about the most snuggly, comfortable duvet I have ever come across! Tyne's room can be quite cold and this is amazing for keeping snuggly - it came from Silk Bedding Direct who are an online producer of fine quality mulberry silk filled bedding - The duvet casing itself is a lusciously comfortable, yet durable and and long lasting, 300 thread count cotton sateen. They are 100% natural and hypoallergenic, and designed to wick away moisture in the event that your child become too hot yet keeps them snug and warm on colder nights, Silk Bedding Direct mulberry silk duvets regulate temperature over a wider range than other duvets. I love the reading corner! Where did you get the canopy from?